Many experts believe the Bacon Pro is the best bacon cooker made for a microwave oven. Made in USA. This bacon cooker cooks more bacon in less time with less work than any other method or device on a stovetop, in an oven, or bacon cooker for a microwave oven. 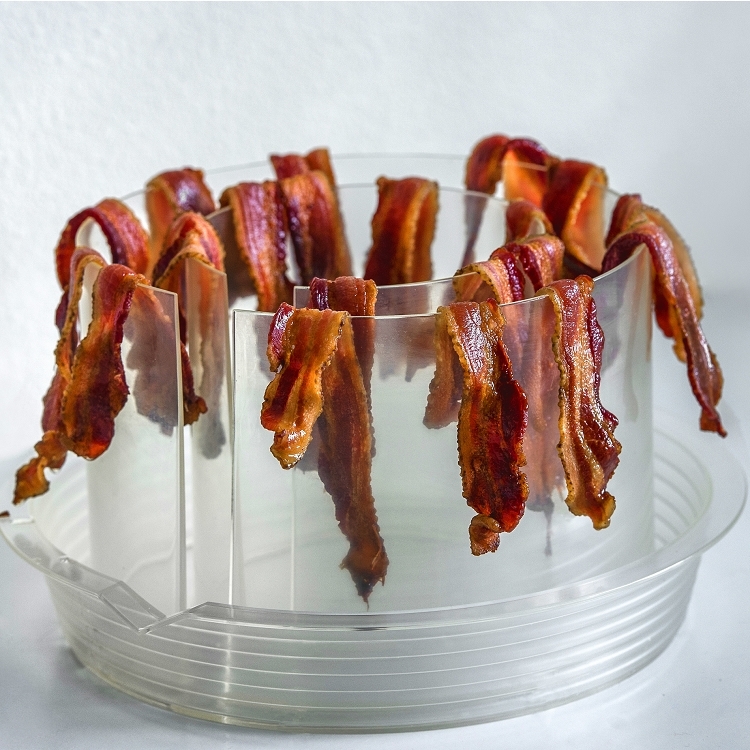 It cooks up to 23 slices of crisp bacon all at once and many housewares experts believe it's the best bacon cooker ever made. 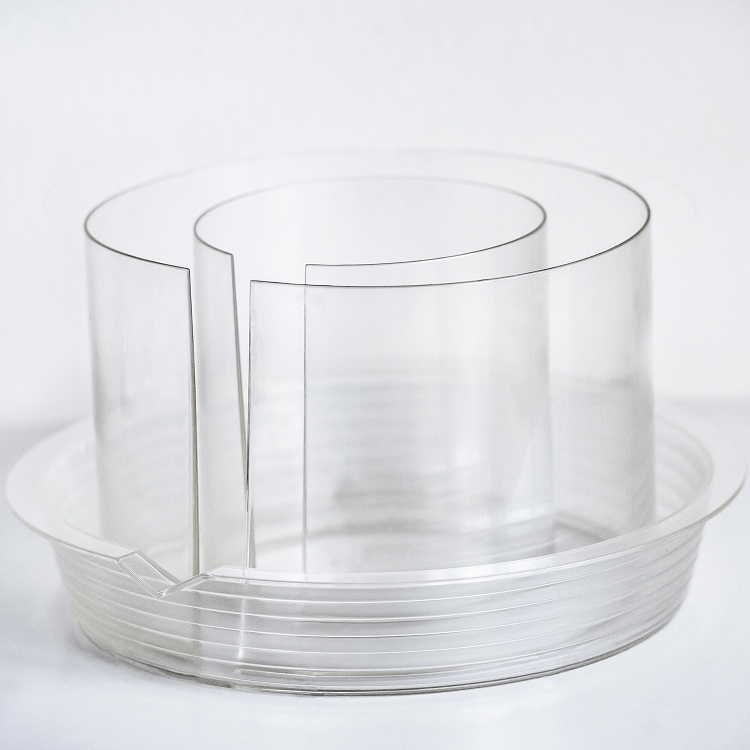 This high-quality bacon cooker for the microwave is made of an expensive food-grade copolymer with exceptional heat resistant characteristics that are transparent to microwaves. It is BPA, melamine, and halogen free. 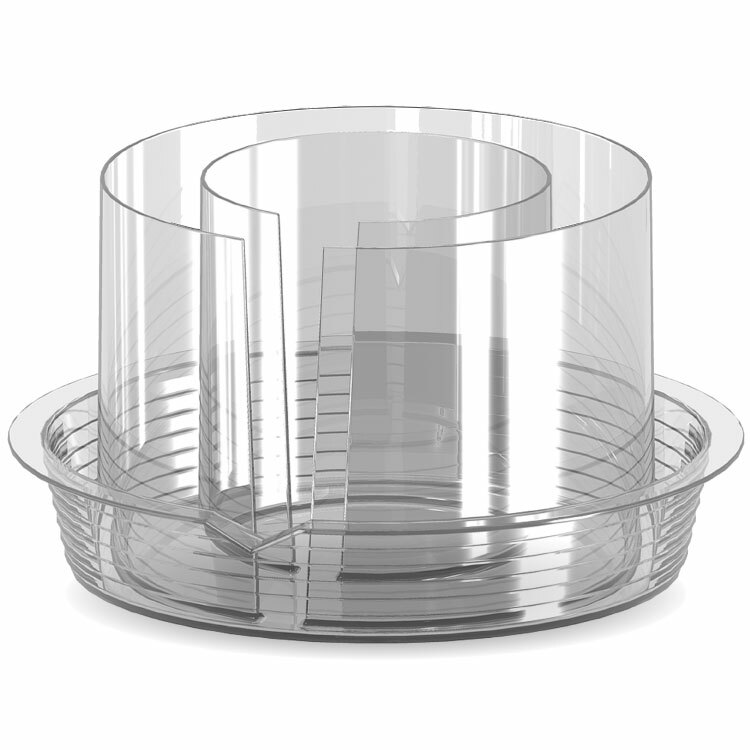 It is dishwasher-safe anywhere in a dishwasher. It is a molded unit with no parts to lose, and it's made in the USA. Until now, a cook would have to spend 10 minutes or more just to prepare just 5 or 6 slices of bacon in the microwave or on the stove-top. It would take 20-30 minutes to cook 7-10 slices if a cook opted for the oven. Add to that; the time involved watching over it, turning, the grease, the smoke, and then there’s clean-up. It is a chore, so stop working so hard to cook a batch of bacon. Go ahead and please your family or guests with plenty of great tasting bacon. Expand your culinary options. You can always save left-over bacon for later use and as a flavor enhancer for other dishes. Click here to to read verified customer reviews of our bacon cooker. Finally, there is a great way to cook bacon and get it done a lot easier. Watch the video. Want to order? Questions? Call us toll-free at 855-563-5446. Our family cooks and eats aprox three pounds of bacon per week . I got so tired of cleaning up the mess on our range top and floor , that I considered not eating bacon ever again . I googled microwave bacon cookers and saw the BACONPRO and decided to take a chance and I ordered it . We cook thick sliced bacon so I wasn't sure how it would crisp it up when cooking . I put over 20slices on , wrapped it with paper towls , set microwave @ 20 minutes and walked away . At the end of the cooking time , I saw the best cooked bacon that I could have ever cooked on the range top . Less fat and crisp . Easy to clean also ....great product . Had to replace our last microwave bacon cooker...decided to try this one. It rocks. Not only can you cook a boat load of bacon, it comes out perfect. Easy to clean, no splattering, dishwasher safe. Love our bacon and love the baconpro. Thanks y'all. Buy and never look back! Love this new invention!! Bacon has never been so easy and effortless. You have to figure out the right ratio of time/piece but once you do, you've got your perfect formula. Hubby takes his out early. I keep mine in longer for the crisp effect! AND...the quality of plastic used is top-notch and makes it SO Easy to clean in the dishwasher. Nothing will destroy this piece! We've used BaconPro a couple of times since purchasing it in late December. It makes great bacon without a mess and the cook-time calculator on BaconPro.com was very helpful. Thanks BaconPro! I own a small deli restaurant and the Bacon Pro has really improved the efficiency of my kitchen. I fill the Pro and cook for 17-20 minutes. Bacon comes out great. I have found it unnecessary to cover with paper towels and it improves the flavor of the bacon. A great find!!! I really like the bacon cooker. It does what it said it does. It is easy to put the bacon strips around the top. It is great to avoid all the greasy spitting that comes from cooking it on the stove, and it it better than just laying the bacon on towels in the microwave because all the grease drips off and is collected in the bottom. It is easy to wash and all the bacon grease just pours off. And I can cook as much bacon as my son will eat! I am very happy with my purchase. Well worth the purchase price! Admittedly I am a sucker for kitchen gadgets. Admittedly I love bacon...who doesn't? But frying bacon can be a real chore, especially if you're frying a whole package. I LOVE, LOVE, LOVE the BaconPro. It makes as many slices as you want in about 9 1/2 minutes in a 1000 watt microwave and, if you follow the directions, there is no mess to cleanup in the microwave. I have done as few as 8 slices of bacon and as many as 20 slices of bacon. If you use this sites cooking time calculator to determine the right amount of time, you simply can't go wrong! Well worth the purchase price! The first batch I made was about 14 slices thick cut, and I was a bit disappointed at first that all the ends did not seem to cook as much as the middle where it folds. I was hesitant to cook it longer for fear it would burn the middles. The second batch I tried, I allotted a full minute per slice (13 thick cut slices), and it was still not quite done on the ends, so I let it go another 2 min or so to see if it would work or burn. It was perfectly crispy (not burned) and just the way we like! 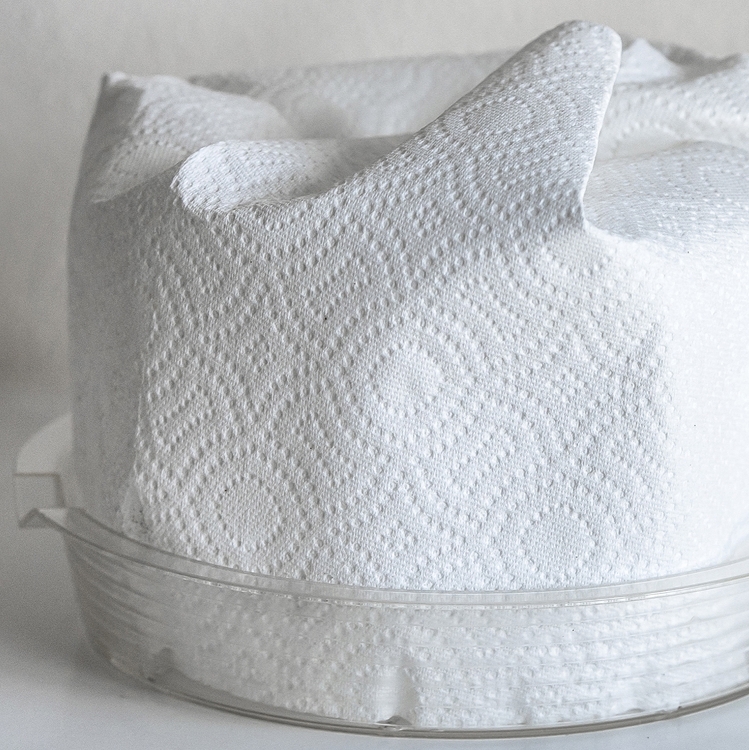 Love the convenience of making a whole package at one time, and the savings in paper towels! The first time I used it, it was rinsed in the sink, then dishwasher cleaned, and the second time was hand washed with hot water - Both options worked just fine. The only issue was making sure we had an aluminum can from the recycle bin, or some other safe way to dump the drippings, but I will take that over the mass amounts of paper towel wasted previously, and the 3 different plates it took to make one package! (A thought for drippings (from my Grandma) if you make bacon often: Use a large metal coffee can with plastic lid - Just keep dumping into it, until it's full enough to toss. She saves hers in the garage out of the way until it's full). WOW--It's great. The bacon cooks well and all the grease fell away. I like it! My microwave required a little more time, but no problem. First batch was regular sliced, going to try thick sliced peppered next. The 4th Bacon Cooker I Tried...It Works Pretty Well. This is the fourth "patent" microwave bacon cooker I've tried, and I have to say it works pretty well. It easily took an entire pound of fairly thin sliced bacon, 17 slices, with room to spare. The fat reservoir can easily hold that much rendered fat without overflowing. Note that slices in the outer ring cooked much faster than those in the inner ring. Even removing the outer slices and giving the inner ones another two minutes didn't bring them to the same degree of cookedness. The design makes washing this by hand nearly impossible, so you must put it on the top rack of your dishwasher. I've been on a quest for perfect bacon for awhile. I've explored multiple microwave bacon tools, baked bacon recipes and techniques (parchment paper, vertical racks, etc), and virtually every other "solution" I've tried. 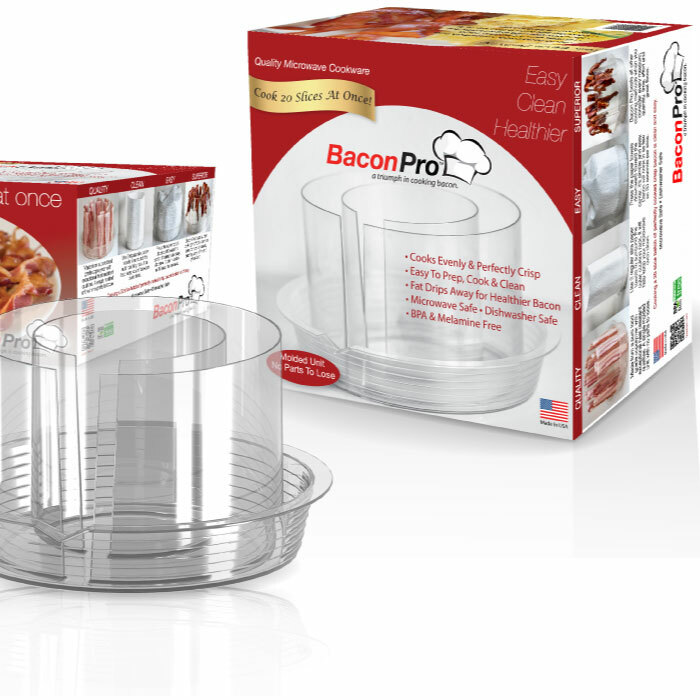 Bacon Pro is the first to reliably and consistently produce perfectly crispy bacon. Period. 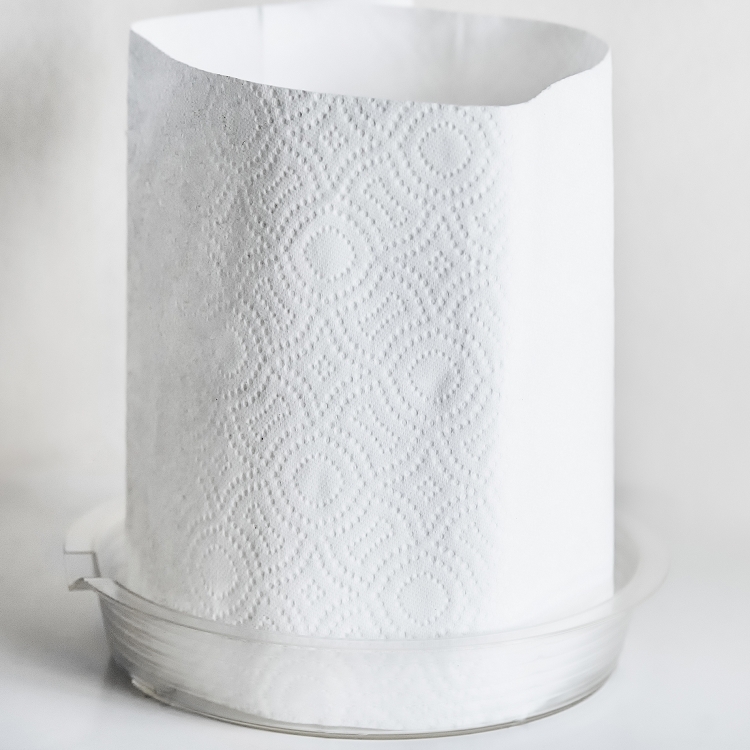 On top of that, it's well-designed to be easy-to-use--grease removal a cinch thanks to the spout, paper towel waste is minimized, and clean-up's a breeze (just put in the dishwasher--although it does take up a lot of space, due to its much-appreciated capacity). Since nothing's "perfect": S&H could be quicker (mine took a two days handling to ship, and a week to arrive, but that included an extra day when USPS "misplaced" my unit). Because I thought the shipment had been lost (the handing tracking option on the Bacon Pro website reported my order "delivered" a day before actual receipt, I had occasion to contact customer service (Kelly) and pleasantly discovered it was very responsive, unquestionably stood behind service (he even offered to express mail me a replacement before USPS finally came through). He also offered extra tips--these guys definitely know their bacon! Cooking calculator not accurate so far for my bacon/microwave. My experience so far with thick-cut bacon in my purportedly 1,100 watt oven requires almost 50% more time than the calculator predicts. Albeit I had 24 slices (vs max 20 allowed on the calculator), and the bacon package was an economy-size three pound slab. I expect "normal" bacon to conform better to the calculator. 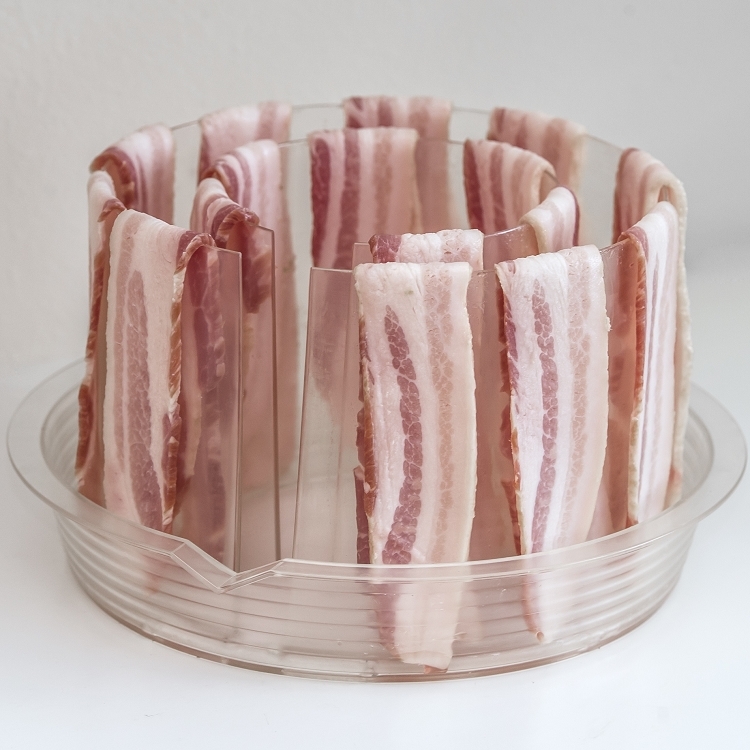 All-in-all, wonderful product, which I'll likely buy again for gifts for other bacon-lovers. I love the Bacon Pro. It saves so much time and makes clean-up a breeze. This is definitely my favorite item in the kitchen! Very satisfied. Able to prepare two lb’s at a time. Easy use and easy cleanup. Salvaging the drippings is a real plus. This is awesome! I got the Bacon Pro for Christmas and just tried it… It makes great “healthy” bacon fast and easy! And, there’s no splatter on my cooktop and it cleans up easily! Also, it frees up one of my skillets so bacon, eggs and hash browns are all done at the same time. I’m going to use it every time I cook bacon! I've used this bacon cooker multiple times now and every time I think, "wow, that was easy". Bacon cooking for me usually meant cleaning up splattered grease off of the stove top or scrubbing a cookie sheet forever if I did it in the oven. This cooks my bacon in no time, and the cleanup is super simple. I just drain the fat into a disposable container and scrub it down with a bit of soap and water. The best part, the bacon comes out better than if I had cooked it on the stove or in the oven! It's crazy. Perfectly crisp every time! I have used the Bacon Pro numerous times and it has worked beautifully! It enables me to cook a whole package of bacon at one time with consistent results in a short amount of time. In addition, the bacon is crispy (like my family likes it) and less greasy. I love the Bacon Pro! Other ways of fixing bacon pale to this...plus it goes into the dishwashers! Hooray! Awesome invention! Thank you Bacon Pro! I bought one Bacon Pro for myself and gave one as a gift. Both worked as advertised and we are both pleased. Much more efficient than in a pan, oven or flat microwave plate. Also like the ease of clean-up. Best thing I have bought for the kitchen in the 40 years I’ve been married!! All I wish is that I would have had this when the kids were growing up!! No major mess to clean and fast and so easy!! Buying some for Christmas gifts!! Cooked bacon the way we like it. We've only used our Bacon Pro once but found it very easy to load and the bacon was cooked just the way we like it. I bought two BaconPros on sale, and am keeping one for us; the other will be a gift. We have used the BaconPro three times since purchasing and have ben very pleased with the results. The first two times were with regular bacon, the third time with thick sliced bacon. The regular bacon came out crisp, following the instructions. The thick sliced bacon took longer to cook, and the outside bacon cooked darker than the inside row. We need to experiment with cooking times for the thick cut bacon. Clean up was fairly easy by hand, the first two times, though it was a bit of effort to get between the rows. The third time, we used the dishwasher on the lower rack, as it didn’t fit on our top rack. It washed clean beautifully. We are very pleased with our BaconPro and look forward to years of use. We've only used it once and was impressed. I need to develop better timing skills. Very innovative and quality product! Q: what is the size of the bacon cooker? A: in It is 11" in diameter and 6" tall.